Groß-Bieberau, 05 October 2018. accessec GmbH has strengthened its research team in September 2018. Our new Research Consultant Sven Feuchtmüller is now supporting the development of concepts, training and research in the areas of Distributed Ledger Technology and Internet of Things. Feuchtmüller has many years of experience in teaching complex subjects – in Germany and during his master’s degree in Sweden. 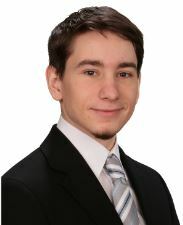 In addition to his work at accessec, he is doing his doctorate with focus on decentralized artificial intelligence.